Oh yes, here's a second SRC reveal for the month of August. This is not my usual reveal with Group A. That still happens on the first Monday of every month. This month the Club has decided to have a little extra fun. The entire club comes together across all Groups for a Themed Reveal Day. The theme this month was Back to School. In this reveal, you can expect to see quick breakfast or dinner recipes, after school snacks and even creative lunchbox ideas. For this reveal, I was assigned Michaela's blog - An Affair from the Heart. Michaela is a girl after my own heart. She doesn't just cook up some amazing food, she used to have an online scrapbooking business. She enjoys family time and loves having extended family around. Her latest creative outlet is in the form of entertaining. You will find loads of ideas on her blog. I was tossing between these Pizza monster sandwiches, Double Chocolate Banana Muffins, S'mores Yogurt and a Pineapple Kiwi Smoothie. I went with the smoothie. It will be perfect as a quick, delicious and nutritious breakfast or an after school snack. When its hot outside, nothings better than a nice tropical smoothie. Or if you are like me and live in the Southern Hemisphere and are waiting eagerly for Spring to get here, this smoothie is bound to take you straight to summer atleast for a few minutes. This smoothie is easy to make and is full of fruity goodness and only used natural honey as a sweetener. That's a win in my book. It was a glassful of deliciousness and I was truly amazed at how thick it turned out. I must admit, in my house it is usually my husband who whips up smoothies for us. Irrespective of what he puts in them, he always manages to make a perfect smoothie and I usually dont have results as good as he does, so I just leave it to him. But after making this smoothie all by my lonesome, I am eager to try out new combinations now. Thank you Michaela for my new found smoothie mojo. I couldn't wait to use my new milkshake glasses and though I know this is a smoothie and not technically a milkshake, I still wanted to use them. Use the pineapple juice to get everything started. Start with about half a cup and add more depending on how thick you want the smoothie. If you are using fresh pineapple pineapple, add some ice to the blender. Serve up in some pretty glasses. I just got a vitamix for my birthday and have been experimenting away. I can't wait to try this one. Nice, I hope you enjoy this as much as we did. With two smoothing recipes in the roundup I think i need to dust off my blender and try them. 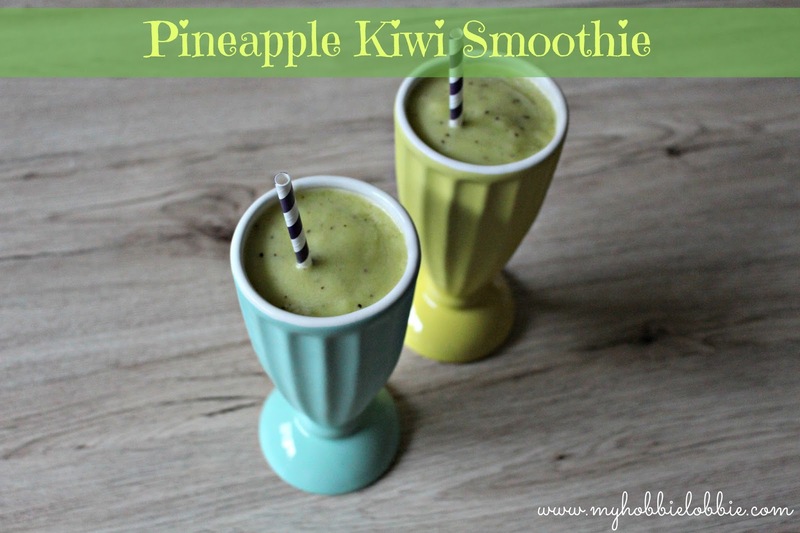 Love the Kiwi and Pineapple combo. I love it too ... it reminds me of a nice sunny beach day :) Thanks for stopping by. I bet this is so refreshing! YUM! It was great. I can't wait to make it again. I made a smoothie for the event too! I have never tried pineapple and kiwi together. It sounds so refreshing! Smoothies just make the perfect snack. I can't wait to see yours! This looks like another wonderful smoothie concoction - I love the tropical flavors! I am a much happier person when I start my day with a smoothie. This sounds delicious. I need to add some pineapple to my smoothies starting now. Happy Reveal Day! I can see why, its a tasty and healthy way to start your day. I may try that this summer. Smoothies are the best after school snack. I think so too Julie. Thanks for stopping by! Wow!! What a combination! Awesome SRC choice!